Stay safe and maintain 100% connection as a first man up or when working away from your primary access or ladder system. 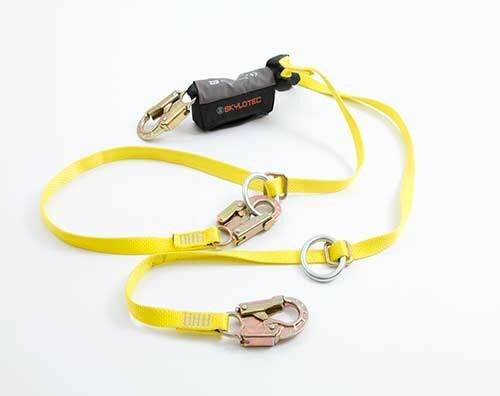 These fall arrest lanyards offer the best balance between freedom of movement, a secure connection and compliance. At the heart any fall arrest system is the shock absorber, Sklotec’s, patented energy absorber will accommodate users that weigh between 50 - 140kg (110 - 310 lbs. ), impact forces will be less than 6 kN at a maximum deployed absorber length of 1.75m (5.7 Feet). The entire system is rated to withstand 22 kN force. In addition, the SKYSAFE PRO meets the most relevant international standards (see specifications). Integrated rescue loops save precious moments in a rescue scenario. These fall arrest lanyards feature all steel connectors for durability and tieback rings to allow easy connection to any size structural component. The inspection process is made easy thanks to shock indicators and a zippered pouch which contains the shock pack.